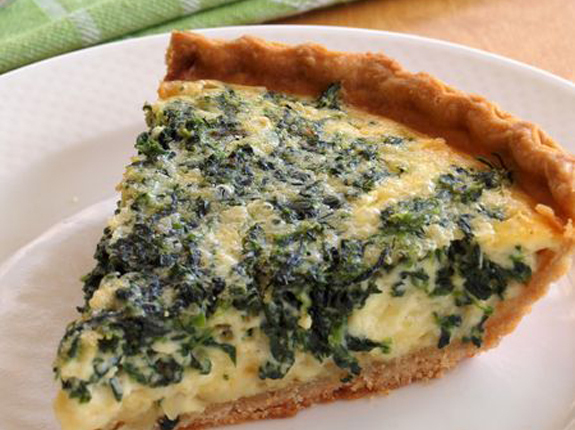 Spinach Quiche--so easy and SO delicious!! Press pie crust into 9" pie pan. Sautee onion, & garlic in butter until onion is soft - add spinach, salt & pepper to taste - set aside. In medium mixing bowl - whisk together the eggs & milk. Spread 1 1/2 cup shredded cheese in bottom of pie crust. Sprinkle remaining 1/2 cup of cheese over top. Bake at 375 degrees for 35 minutes. If crust starts to get too brown - cover edges with tin-foil. This recipe says "8 servings", I find that depends on what else you're serving with it and how hungry people are!